Ideal for the beginner or student, these attractively priced sets feature good quality sable hair brushes in useful combinations. They are good for all types of media. 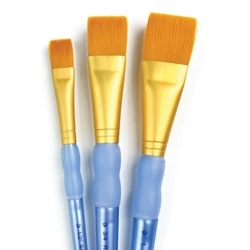 This Set includes 3 Flat Brushes Sizes 1/2", 3/4", and 1".